I’m sitting in the McCarran International Airport in Las Vegas about to head back home to attend a wedding from a wonderful Astricon which is still going (until Friday!). Just wanted to send you all a quick note that today we finalized FreePBX 12 with the release of Framework 12.0.2. This means we are officially certifying it “stable”. Bug reports are always welcome and can be filed at http://issues.freepbx.org. The new #FreePBX v12 is awesome. I use my #Asterisk box with the #FreePBX distro from @schmooze. Dashboard is sick. @tm1000 nice blog entry about #FreePBX 12 http://t.co/yWXnzRVemk Looks awesome the new interface KUDOS for the @freepbx dev team. Just loaded @freepbx 12 for the first time. Installed of USB. These are awesome updates @tonyclewis ! 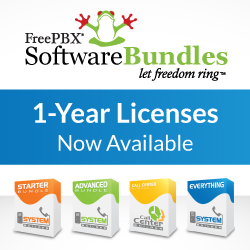 The easiest way to get access to the Release Candidate is by downloading the FreePBX Distro at http://schmoozecom.com/distro-download.php and following the steps in http://wiki.freepbx.org/display/HTGS/1.+Install+FreePBX. You can also download the tarball of just FreePBX manually from http://www.freepbx.org/download-freepbx and run through the setup processes documented in http://wiki.freepbx.org/display/HTGS/Version+12.0+Installation. So where do we go from here? What’s in the woodwork for FreePBX 13 and above? There are a few things we’ve all hashed around but nothing is set in stone yet, hopefully in the next few weeks we can start working with you on what will be included in FreePBX 13. One last thing, something that is important to me that I think we need to do more of is community blogging. Perhaps going over features or giving you more updates about what we are doing internally along the same lines as what Philippe did in years past. I’d like to engage more with you and get opinions and ideas about what you’d like to see in future versions of FreePBX. Remember that feature requests are always welcome at http://issues.freepbx.org. So won’t you join me on this crazy ride we call VoIP? Next PostCyber Monday 50% off FreePBX Commercial Modules, and other news!